Beer lovers must believe that San Diego really is “America’s Finest City.” Unofficially dubbed the “nation’s craft beer capitol,” more than 100 breweries call SD home. When you think about it, it makes sense. Our city’s laid back coastal lifestyle pairs perfectly with an ice-cold brew. They just go together like beaches and bikinis…the proverbial match made in heaven. And, what else goes really great with beer? You guessed it. Pizza. And that’s the simple idea behind Wheat & Water’s “Get to Know a Brewery” Series. It’s an easy way for you to sample the best local breweries have to offer, one pint at a time. The beers featured during each series are hand-picked by the team at Wheat & Water. The goal is to feature signature beers, ones that are rare and/or interesting, or ones that go down easy. But, they all have one thing in common, no matter the brewery: they all go great with pizza. “We’d like customers to enjoy the flavors of their beer as much as they enjoy their pizza,” said Doug. Wheat & Water kicks off the series inaugural event on Friday, April 28th with Societe Brewing out of Clairemont Mesa, San Diego. Followed by Doug’s long-time friends at Hess Brewing on May 19th and Modern Times on June 23rd. Be sure to mark your calendar and snag a signature glass while supplies last! The kegs will be tapped at 6pm at Wheat & Water in Bird Rock, so please call for a reservation 858-291-8690, or put in a reservation request here. Based on the simple principles of high-quality ales and lagers built to advance beer’s reputation and place in the modern world by remaining true to its Old World roots, Societe aims to strip away all barriers to beer enlightenment and enjoyment and, in the process, start and perpetuate meaningful conversations. Societe self-distributes, and they limit the accounts with their brews on tap. It was a nice ego boost to Wheat & Water, when they came calling. Ted Cochrane, founder of Wheat & Water, and Chris Anderson took a trip to Societe's brewery to do a little research and development. After a brewery tour from Societe's Kyle Shockney and a tasting of Societe's current offering, a business partnership grew into a welcomed friendship. 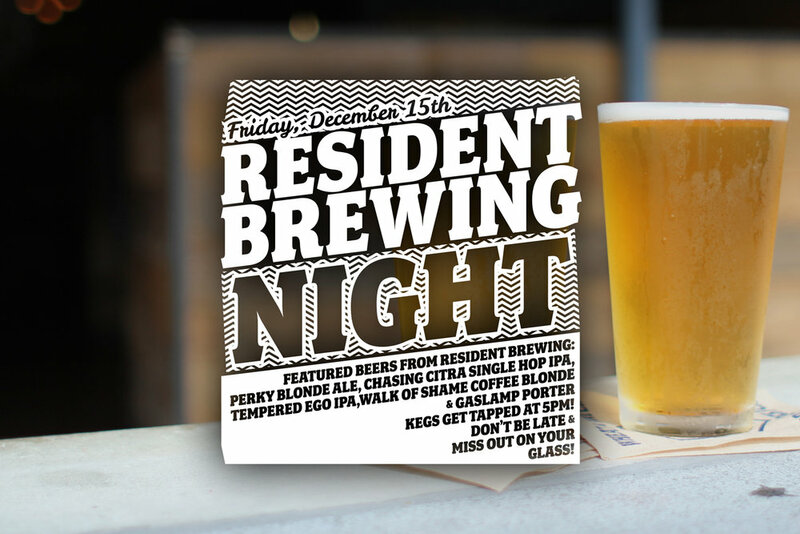 So, what better way to celebrate than our Societe Brewing Night!? Come in, drink some brews, make good conversation, and keep the glass. See you here on Friday, April 28th! The Harlot sits perfectly between a Czech lager and a Belgian Ale. It starts with a pilsner recipe then is fermented with Societe’s ale yeast. A light, crisp beer with that well-rounded and complex Belgian body. Perhaps it wasn’t a style that was meant exist, but we’re sure glad this beer does. Named 2013 Beer of the Year by The Brewing Network. The Apprentice focuses on hops from the Pacific Northwest with Centennial, Simcoe and Amarillo all hailing from Washington. The result is an assertively bitter and piney (Simcoe) brew with floral notes (Centennial) and grapefruit and orange (Amarillo). As with any West Coast IPA, the focus is on the hops. The floral notes of Centennial in combination with the grapefruit-citrus notes of the Citra create exactly what you’re craving. (In the weeks preparing for the Societe Tap Takeover, we pulled in The Pupil, and we’re learning it’s difficult to keep enough Pupil kegs in stock!) The kicker here is the Nelson Sauvin, and if you read about or attended our Green Flash-Alpine Brewing Tap Takeover, then you know how rare and celebrated these New Zealand Nelson hops have become. It’s the strong white wine (see – Nelson SAUVIN) astringency and tangerine and grapefruit notes that keep beer-lovers asking for more. The Bachelor is an exploration in hops. Each beer is brewed with a base IPA recipe and a single hop varietal, thus isolating the hops unique characteristics. Version 26? Hop: We don’t even know yet! So we’re also looking forward to Friday! Previous versions featured: Cascade, Centennial, Mosaic, Motueka, Chinook, Citra, Azacca, Amarillo, Rakau, Sorachi, Ace, Jarrylo, Simcoe, El Dorado, Northern Brewer, Galaxy, Hallertau Blanc, Mandarina Bavaria, Eureka!, Idaho 7, Calypso, Nugget, African Queen, Nelson Sauvin, CTZ. IPA-lovers shouldn’t skip over The Coachman Session IPA. One might think this is why the marketers over at Societe have referred to it as a “Really Small IPA” in order to differentiate it from the stigma of Session IPAs—“hop-flavored water.” We’ll start with Simcoe for bittering and piney notes and Mosaic for floral and tangerine and berries. In the Coachman we also have the noble hop varietal of Saaz, a noble hop for adding those earthy aromatics and crisp spiciness of lagers and pilsners. The result creates a floral and hoppy brew than doesn’t fall flat in the end--instead you get the crisp, herbal finish and the low ABV. To break up the tasty list of IPA, we've added Societe's Dry Stout. It's a very drinkable, extremely low-alcohol stout that doesn't skip on the roasty malt aromatics and earthy hop-bitterness in the finish. i.e. Save room for dessert! Green Flash Brewing & Alpine Brewing Co. Takeover! On Friday, March 3rd, Wheat & Water will feature flights & pints of Alpine Brewing Co. & Green Flash’s rarest & most popular brews. And that’s not all! The first 48 people who order a pint of one of the featured beers get to take home a signature glass from one of San Diego’s best local breweries. Once named Beer of the Week by the Washington Post, Alpine Nelson Golden Rye IPA is a single-hop brew made with one of the world’s rarest and most sought after hop varietals. This is the kind of beer that gets your taste buds tingling. It’s all about the hops. Nelson Sauvin hops are grown in New Zealand …and hops from New Zealand are very rare. Hailing from Nelson New Zealand, an area known for producing high-quality Sauvignon Blanc wine—and those juicy, tropical fruit flavors appear in their hops, too. Created especially for Yard House’s 20th Anniversary in late 2016, this beer is as delicious as it is hard to find. And, if you hear the term “triple IPA” and cringe because you’re someone (like me) who’s not a fan of getting smacked in the mouth with a super hoppy, bitter brew—don’t worry. Because even though Celebration is brewed with three different types of hops, triples are known for being smooth and extremely well-balanced. Not to mention, with an ABV of 10.50%, it’s pretty boozy. All three come from the Yakima Valley in Washington State, and are all known for their sweet (almost Jolly Rancher-esque) aromas and tropical fruit flavors like pineapple or mango. From Dave Adams at Green Flash: "The base of this beer is the base for the Cellar 3 Natura Morta beer series. We start with that beer and age it in some single varietal wine barrels and add Brettanomyces. Then, we dry-hopped the hell out of it with Mosaic hops and another rotating hop varietal, which provides an amazing aroma and flavor. The final result is a bright, hoppy aroma with notes of blueberry, mango and citrus with a mild tartness from the Brett and a bone dry, sparkling wine-like finish." * Correction: an earlier version of this post listed this beer as the Cellar 3 Blanc Tarte Barrique Sour Blonde Ale. Instead, we scored the Dry-hopped Fresco Sauvage Wild Ale! Grab A Pint Before the Kegs Kick! All three rare beers are only available in limited supply—and we only have a handful of signature glasses to go around. So, come in early, enjoy and imbibe!